Henry the Young King (28 February 1155 – 11 June 1183) was the eldest surviving son of Henry II of England and Eleanor of Aquitaine. Beginning in 1170, he was titular King of England, Duke of Normandy, Count of Anjou and Maine. Henry the Young King was the only King of England since the Norman Conquest to be crowned during his father's reign, but spent his reign frustrated by his father's refusal to grant him meaningful autonomous power. He died aged 28, six years before his father, leaving his brother Richard to become the next king. Little is known of the young Prince Henry before the events associated with his marriage and coronation. His mother's children by her first marriage to Louis VII of France were Marie of France, Countess of Champagne and Alix of France. He had one elder brother, William IX, Count of Poitiers (d. 1156), and his younger siblings included Matilda; Richard; Geoffrey; Eleanor; Joan; and John. In June 1170, the fifteen-year-old Henry was crowned king during his father's lifetime, something originally practised by the French Capetian dynasty and adopted by the English kings Stephen and Henry II. 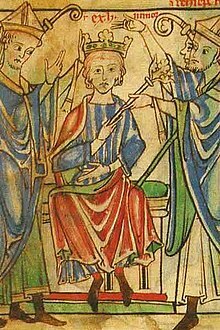 The physical appearance of Henry at his coronation in 1170 is given in a contemporary court poem written in Latin, where the fifteen-year-old prince is described as being very handsome, "tall but well proportioned, broad-shouldered with a long and elegant neck, pale and freckled skin, bright and wide blue eyes, and a thick mop of the reddish-gold hair". He was known in his own lifetime as "Henry the Young King" to distinguish him from his father. Because he was not a reigning king, he is not counted in the numerical succession of kings of England. According to one of Thomas Becket's correspondents, Henry was knighted by his father before the coronation, but the biographer of William Marshal asserts that the king was knighted by William in the course of the rebellion of 1173 (Georges Duby, Guillaume le Maréchal. Le meilleur chevalier du monde. 1984). Henry did not appear to have been very interested in the day-to-day business of government, which distinguished him from his father and younger brothers. His father, however, is reputed to have failed to delegate authority to his son, retaining power in England. The majority opinion amongst historians is that of W. L. Warren (1973): "The Young Henry was the only one of his family who was popular in his own day....the only one who gave no evidence of political sagacity, military skill, or even ordinary intelligence...", and elaborated in a later book, "He was gracious, benign, affable, courteous, the soul of liberality and generosity. Unfortunately he was also shallow, vain, careless, high-hoped, incompetent, improvident, and irresponsible." The Young King's contemporary reputation, however, was positive. Likely this was due to the enthusiastic tournament culture of his time. In the History of William Marshal, the biography of the knight assigned to him as a tutor in 1170 and his tournament team leader until 1182, he is described as a constant competitor at tournaments across northern and central France between 1175 and 1182. With his cousins, counts Philip I of Flanders and Baldwin V of Hainaut, he was a key patron of the sport. He is said to have spent over £200 a day on the great retinue of knights he brought to the tournament of Lagny-sur-Marne in November 1179. [He was] the best king who ever took up a shield, the most daring and best of all tourneyers. From the time when Roland was alive, and even before, never was seen a knight so skilled, so warlike, whose fame resounded so around the world – even if Roland did come back, or if the world were searched as far as the River Nile and the setting sun. There was a perception amongst his contemporaries, and the next generation, that his death in 1183 marked a decline both in the tournament and knightly endeavour. His one-time chaplain, Gervase of Tilbury, said that "his death was the end of everything knightly". The young Henry played an important part in the politics of his father's reign. On 2 November 1160, he was betrothed to Margaret of France, daughter of King Louis VII of France and his second wife, Constance of Castile, when he was 5 years of age and she was at least 2. The marriage was an attempt to finally settle the struggle between the counts of Anjou and the French kings over possession of the frontier district of the Norman Vexin, which Louis VII had acquired from Henry's grandfather, Geoffrey Plantagenet, Count of Anjou, in around 1144. By the terms of the settlement, Margaret would bring the castles of the Norman Vexin to her new husband. However, the marriage was pushed through by Henry II when Young Henry and Margaret were small children so that he could seize the castles. A bitter border war followed between the kings. They were formally married on 27 August 1172 at Winchester Cathedral, when Henry, aged seventeen, was crowned King of England a second time, this time together with Margaret, by Rotrou, the Archbishop of Rouen. Young Henry fell out with his father in 1173. Contemporary chroniclers allege that this was owing to the young man's frustration that his father had given him no realm to rule, and his feeling starved of funds. The rebellion seems, however, to have drawn strength from much deeper discontent with his father's rule, and a formidable party of Anglo-Norman, Norman, Angevin, Poitevin and Breton magnates joined him. The revolt of 1173–1174 came close to toppling the king; he was narrowly saved by the loyalty of a party of nobles with holdings on the English side of the Channel, and by the defeat and capture of William I, the King of Scotland. Young Henry sought a reconciliation after the capture of his mother, Eleanor of Aquitaine, and the failure of the rebellion. His funds were much increased by the terms of the settlement, and he apparently devoted most of the next seven years to the amusement of the tournament. In November 1179, he represented his father at the coronation of Philip Augustus as associate king of France at Reims. He acted as Steward of France and carried the crown in the coronation procession. Later, he played a leading role in the celebratory tournament held at Lagny-sur-Marne, to which he brought a retinue of over 500 knights at huge expense. The Young Henry's affairs took a turn for the worse in 1182. He fell out with William Marshal, the leader of his tournament mesnée. The unknown author of L'Histoire de Guillaume le Maréchal suggests that Marshal's disgrace was because he had indulged in a clandestine affair with Queen Margaret. David Crouch, one of the Marshal's principal modern biographers, argues that the charge against William was actually one of lèse majesté, brought on by Marshal's own arrogance and greed. By this account, the charge of adultery was only introduced in the Life of William Marshal as a distraction from the real charges, of which he was most probably guilty. Though the Young King sent his wife early in 1183 to the French court, it was done most likely to keep her safe in the impending war with his brother, Richard, rather than because she was in disgrace. The only child of Henry and Margaret was William, born prematurely on 19 June 1177, and died three days later. This difficult delivery may have rendered her barren, for she had no further children. Henry the Young King died, aged 28, in the summer of 1183, during the course of a campaign in Limousin against his father and his brother Richard the Lionheart. He had just completed a pillage of local monasteries to raise money to pay his mercenaries. He contracted dysentery at the beginning of June. Weakening fast, he was taken to Martel, near Limoges. It was clear to his household that he was dying on 7 June, when he was confessed and received the last rites. As a token of his penitence for his war against his father, he prostrated himself naked on the floor before a crucifix. He made a testament and, since he had taken a crusader's vow, he gave his cloak to his friend William Marshal, with the plea that he should take the cloak (presumably with the crusader's cross stitched to it) to the Holy Sepulchre in Jerusalem. On his deathbed, he reportedly asked to be reconciled to his father, but King Henry, fearing a trick, refused to see him. He died on 11 June, clasping a ring his father had sent instead as a sign of his forgiveness. After his death, his father is said to have exclaimed: "He cost me much, but I wish he had lived to cost me more." After Henry's death, there was an attempt by his mother and a faction of his friends to promote his sainthood. Thomas of Earley, Archdeacon of Wells, published a sermon not long afterward detailing miraculous events attending the cortège that took his body north to Normandy. Henry had left orders that his entrails and other body parts should be buried at the abbey of Charroux, but the rest of his body should rest in Rouen Cathedral. However, during the funeral procession, a member of Henry's household was seized by his mercenary captains for debts the late king had owed them. The knights accompanying his corpse were so penniless they had to be fed by charity at the monastery of Vigeois. There were large and emotional gatherings wherever his body rested. At Le Mans, the local bishop halted the procession and ordered the body buried in his cathedral, perhaps to help defuse the civil unrest Henry's death had caused. The dean of Rouen recovered the body from the chapter of Le Mans a month later by a lawsuit, so that the Young Henry could be buried in Normandy as he had desired in his testament. Henry's remains are in Rouen Cathedral, where his tomb is on the opposite side of the altar from the tomb of his younger brother, Richard I of England, with whom he was perpetually quarrelling. The tomb of the Archbishop of Rouen, who had married him to Margaret, lies nearby in the ambulatory. His brothers Richard and John each later became King of England. Wikimedia Commons has media related to Henry the Young King. Henry and Richard were "both tall in stature, rather above the middle size, and of commanding aspect. In courage and magnanimity they were nearly equal; but in the character of their virtues there was great disparity... [Henry] was admirable for gentleness and liberality... had a commendable suavity... commended for his easy temper... remarkable for his clemency... the vile and undeserving found their refuge in [Henry]... was the shield of bad men... was bent on martial sports... bestowed his favours on foreigners... [Henry's] ambition magnanimously compassed the world." ^ Historians are divided in their use of the terms "Plantagenet" and "Angevin" in regard to Henry II and his sons. Some class Henry II to be the first Plantagenet King of England; others refer to Henry, Richard and John as the Angevin dynasty, and consider Henry III to be the first Plantagenet ruler. ^ Matthew Strickland (10 June 2016). Henry the Young King, 1155-1183. Yale University Press. p. 153. ISBN 978-0-300-21551-9. ^ Crouch, David. Tournament. 4. pp. 21–22. ISBN 9781852855314. ^ Warren, W.L, Henry II, (London: Eyre Methuen, 1973), pg.800. ^ Mesnée is an Old Norman French word, meaning household. ^ This tomb contained a lead reliquary, with Richard's heart, that is stored with the treasure of the Cathedral. His body is in the Fontevraud Abbey.